Stacy Tilton Reviews: How does your dog like to play? How does your dog like to play? Our pup Java is a big 50lb terrier mix and boy does she love to play. Being a larger sized dog we have to really watch what we give her to play with though. Take for instance the Hartz plush Quackers®, give that to her and she won't stop chewing at it until she gets the noise mechanism out. There's just something about squeakers that drives her crazy. Or if she realizes something is stuffed she will keep at it until she can pull the stuffing out. Makes it a little harder when looking for toys to keep her mind active during the day while we are doing other things. 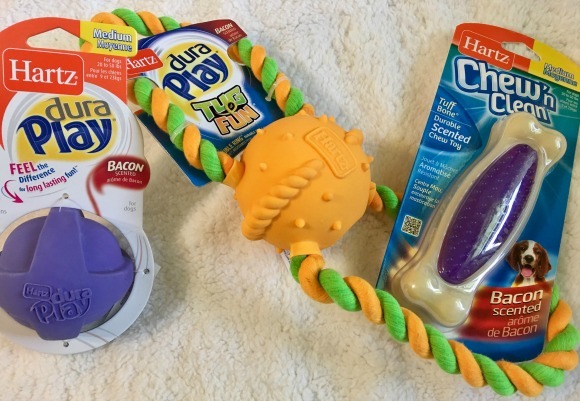 Thankfully Hartz has other great toys for us to choose from like the Chew ‘n Clean® Tuff Bone®. Now this is the perfect toy for her. She can chew and chew until her heart is content and we don't have to worry we will find a mess when we check on her. Of course if you were to give her the Dura Play® Tug of Fun® Double Ring™ she would chew on the rope part until she turned it into a pile of threads. So knowing that we will play tug of war with her then put it up for later. Tug of war is one of her favorites so anytime you pull it out she's right there ready to play. You just have to be careful because she likes to try and get a hold of the loop that you're holding onto. And being a big dog sometimes she gets her way and then you're stuck with a wet soggy handle to hold onto! 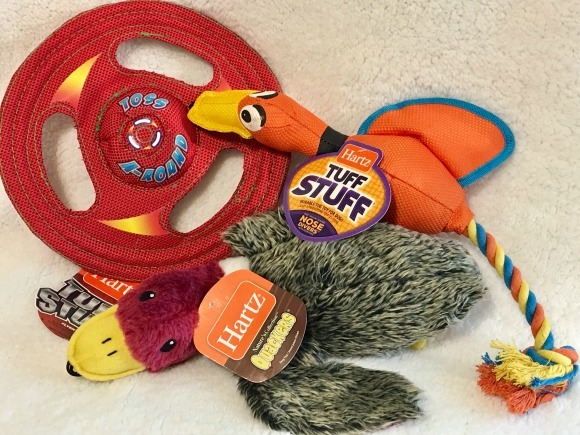 According to Dr. Georgette Wilson, DVM, the Director of Scientific and Regulatory Affairs and resident veterinarian at Hartz Mountain Corp "There are four primary play patterns" a dog will engage in. "Some dogs may have one favorite way of playing, others alternate among different types of play. The main play patterns are Toss & Retrieve, Tug, Comfort & Security, and Chew." What play pattern does your dog prefer? We have some of these toys and our dog loves the ones that smell like bacon.